With 21% of adults in Scotland lacking basic digital skills, tackling digital exclusion is high on the agenda. But where do you start and who is in a position to help? This photo, taken during the recent visit of Fiona Hyslop, Cabinet Secretary for Culture, Tourism and External Affairs, to The Welcoming in Edinburgh represents some of the key people, organisations and initiatives who can make a difference. There is the political commitment to change, and the provision of much-needed funding and resources. Ms Hyslop’s visit marked the opening of the sixth round of funding of the Digital Participation Charter Fund. The Charter Fund, administered by SCVO, offers small grants (up to £10,000) to community organisations for local digital learning projects. Since the Charter Fund opened in 2014 it has supported over 15,000 high-need learners to develop basic digital skills. Third sector organisations are well-placed to tackle digital exclusion by engaging the communities they work with. The Welcoming is one of over 100 organisations who have benefitted from Charter Fund support. Over the last year it has allowed us to introduce new digital skills courses to our regular timetable of learning opportunities for newcomers, designed to help people settle in and achieve their potential in Scotland. There are dozens of facilitators and trainers working to share their expertise and enthusiasm with all things digital. In our case, our tutor Saad Ibrahim combines great knowledge with considerable warmth and humour, and has been pivotal to developing confidence and enjoyment amongst our participants and ensuring the success of the programme. There are the learners themselves who take on the challenge of developing new skills and exploring the unfamiliar. 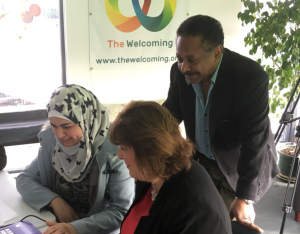 At the Welcoming our learners are adults of all ages who are newly arrived in Scotland and urgently need basic digital skills to support their lives here. The need is particularly acute for those who have been forcibly displaced, have missed out on stability and learning opportunities in recent years and have arrived in Scotland without ever expecting or choosing to be here. During our classes, they have been able to set up email addresses, harness social media to keep in touch with friends and family, master online banking, work out how to bid for council houses and get to trips with online shopping. The flexibility of the Charter funding means that organisations can design courses and drop-ins to meet the needs of their particular learners. In our case, offering classes in both Arabic and English allows Arabic speakers to get stuck in to digital classes straight away without having to wait until their language skills improve. The outcomes have been meaningful – not just in relation to specific digital skills, but also in terms of confidence, inspiration, social bonding and developing prospects for employment and further study. There are other elements outside the picture too, such as partner organisations, volunteers and supporters who can support digital participation in unexpected ways. In our case, this is beautifully evidenced by the Edinburgh Remakery and members of the public who have generously donated to their ‘Laptops for Refugees’ campaign, providing our participants with much appreciated laptops for home use. Any organisation from the public, private and third sector can also sign up to the Digital Participation Charter in order to show their commitment to helping people in the community and their own workforce to build basic digital skills. On this note, we have challenged ourselves to embrace new digital tools in our everyday work; one outcome is that we are now all keen Canva users and our publicity and poster skills have dramatically improved. *This blog originally featured on the Scottish Government’s blog site on 5 April 2018.